Student Passes are available online for current Yale students and require a valid Net ID. 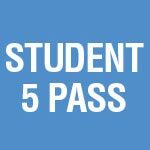 Students from other schools may purchase discounted passes by calling 203.432.1234 or visiting the box office at 1120 Chapel Street and providing current proof of full-time student status. You may purchase two passes per Student ID and may be asked to show proof of eligibility to enter the performance. Buy before October 20 and get a sixth ticket free!